Following today’s loss Aaron Boone announced Didi Gregorius tore cartilage in his right wrist sliding into home plate on Aaron Hicks’ walk-off double yesterday night. Gregorius went for an MRI today and received a cortisone shot, and will be re-evaluated in a few days. It’s not certain when he’ll return. Here’s the play that led to the injury. 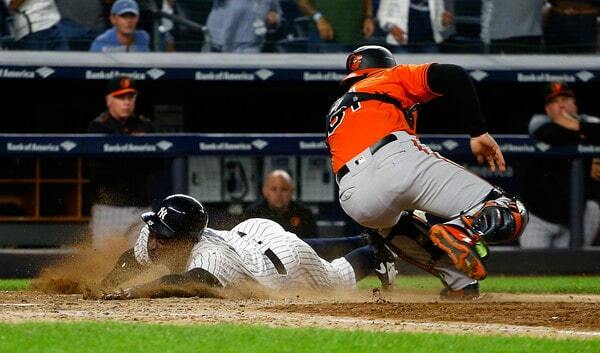 It looked like a fairly clean slide, but, after looking at it again, you can see Didi jams his right wrist into the ground. I guess that’s when the injury happened. “I would not want to sit out and watch that (Wild Card Game),” added Didi. He said his wrist felt fine yesterday, but he woke up with pain today. For what it’s worth, Didi said his level of optimism is “high” because it already feels better. Fingers crossed. Even without a fracture, wrist injuries can be very tricky, as we just learned with Aaron Judge. Even if Gregorius responds well to the cortisone shot and is able to return to the lineup in a few days, the injury could easily take a bite out of his production. Hopefully he responds well, but this is potentially very bad news. The Yankees do have options to replace Gregorius at shortstop should he miss the duration of the season. Adeiny Hechavarria, who played short today, is a defensive standout who could play the position full-time. (Good thing they got him before the postseason-eligibility deadline, huh?) The Yankees could also move Gleyber Torres to short and go with Neil Walker or Ronald Torreyes at second. Either way, losing Didi is a huge blow. He is close to irreplaceable.